From left are planning commission members Mike Long, Jim Moyer and Doug Ruch. Long and Moyer were filling in for regular board members. WARSAW — Selling and installing solar panels is apparently a thriving business. Solar Energy Systems, located just south of Nappanee in the Cornerstone Acres development, is a growing business and petitioned the Kosciusko County Area Planning Commission to alter some of the restrictive covenants placed on the business when it first moved to CR 1350N at the intersection with SR 19 in Scott Township. 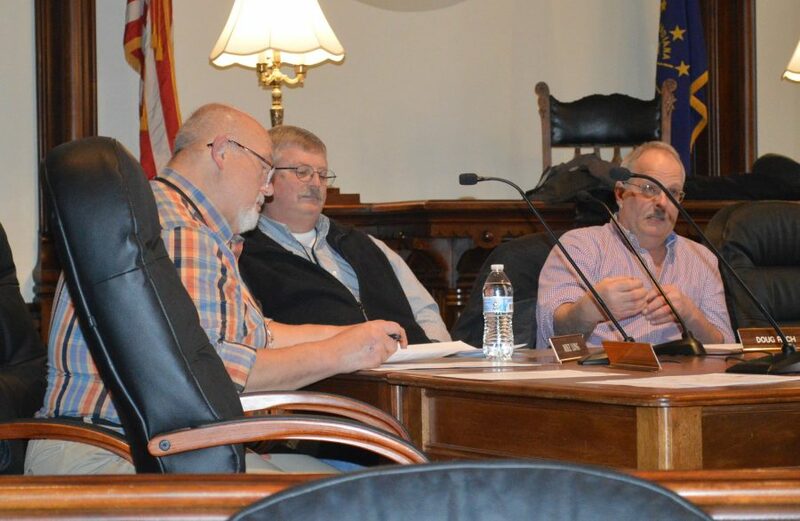 The first meeting of the APC in 2019 was held Wednesday afternoon, Feb. 6, at the county courthouse in Warsaw. No meeting was held in January due to a lack of an agenda. Essentially the request involves altering the eight covenants placed on the business when the original rezoning was approved in 2016. Outside storage will now be permitted, though it will be in a fenced-in area. Two structures will now be allowed on the property with the second structure being the solar panels installed by Solar Energy Systems. Since the business is considered a gateway to the south side of Nappanee and also a gateway to Kosciusko County, the importance of visual appeal was stressed by Dan Richard, area planning director. Landscaping will be done and also some screening with trees of some type, though neither will be done to the point the visibility of the business is restricted. An 8-foot tall security fence with slats will also be installed as it was noted there have been several instances of people parking their cars and leaving them there for the weekend or a few days. Several vehicles have been towed away. In other business, the APC recommended approval for Mark Hochstetler to rezone a 5-acre tract of ground on CR 1350N, west of SR 19 in Scott Township from residential to agricultural. Hochstetler bought the parcel at an auction and thought he could have a house and barn with horses on property zoned residential, but a barn with horses is not a permitted use for that type of zoning. Bob Conley of the APC noted there is a county regulated ditch going through the property and asked if Hochstetler is aware of that and he said he is aware of it. County commissioners will consider the rezoning at their Feb. 19 meeting. Also on the agenda, the planning commission approved a preliminary plat for a agricultural II subdivision for Jason and Vera Schwartz on CR 200W, north of CR 300N in Plain Township. The number of sell-offs allowed by county ordinance have been exhausted and agricultural II allows another lot. In other business, approval was recommended for Brian Erne to rezone ground from agricultural to residential on CR 450N at the intersection with EMS B40 Lane in Tippecanoe Township. Erne said he also bought another lot nearby and wants to build a house on the property located on CR 450N. He said he and his wife plan to make improvements to the area including the removal of some brush which he said is an eyesore. A letter of remonstrance was received from a nearby property owner who doesn’t want to see a mobile home or metal storage building placed on the property, but Erne said he has no intentions of doing so. The county highway department recommends driveway access to the house be off Old Shoe Lake Road. County commissioners will consider the petition at their Feb. 19 meeting. And the APC approved a preliminary plat for a two-lot subdivision as petitioned by Endless Summer on Country Club Road in Wayne Township. Officers for the planning commission for 2019 were elected and Lee Harman will be chairman, Kevin McSherry vice chairman (replacing Chuck Haffner) and Mike Kissinger will be the secretary.